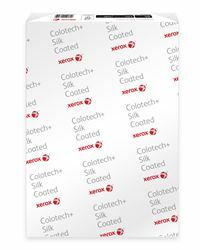 Xerox Colotech+ Silk Coated paper iGen delivers guaranteed performance on digital colour copiers and printers. This double side coated paper has a lower sheen level which enhances text without compromising on image impact. The coated surface gives near offset print quality from your digital colour printer. FSC Certified.